Product #18305 | SKU PC-14 | 0.0 (no ratings yet) Thanks for your rating! High power, lightweight, ergonomic design & exclusive IDX interface. 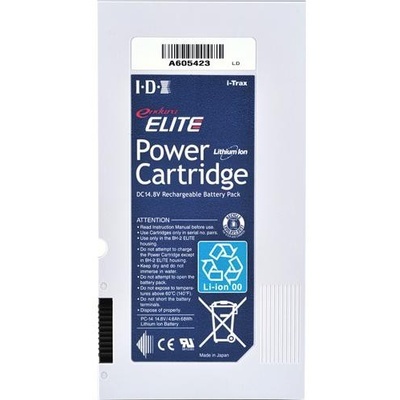 The IDX Endura Elite PC-14 is a Power Cartridge Lithium-Ion (Li-Ion) battery pack. The high power, lightweight, ergonomic design and exclusive IDX interactive features of the PC-14 makes it an excellent solution for portable battery power. This battery system has been certified for unrestricted airline carry on applications. Management software package allowing battery history and condition via PC access. Five LED lamps located on the operators side of camera offer a quick-look reference of remaining battery capacity. The 14.8VDC design of the Endura Elite battery complies with equipment manufacturers specifications, eliminating all 12VDC battery problems The Endura Elite is designed in a 14.8VDC configuration with a full discharge rating of 12VDC. Therefore, the Endura will always deliver 100% capacity before the camera ever reaches its cutoff point. The Power Cartridge system houses two cartridges inside the Elite pack. Cartridges can be easily exchanged when one cartridge fails, this reduces the cost of battery replacement. V-Mounts are becoming more and more prevalent on many new broadcast and professional camcorders. 3.94 x 6.69 x 2.76"